They are formed as a collection of abnormal blood vessels which can bleed, and this may extend beyond its fragile walls. 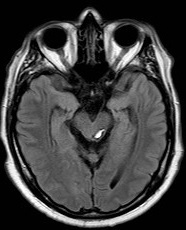 Cavernomas may be seen in 0.1-0.5% of the population and some have a genetic basis. They are commoner in Hispanic communities (especially Mexican-American). There is no large feeding artery or large draining vein. The deep situated lesions tend to bleed more than superficial. Focal Seizures, focal neurology or raised ICP, Headaches or Hydrocephalus. CT or MRI may show a "raspberry or popcorn like" Cavernoma +/- associated haemorrhage. MRI SWI or GRE is the modality of choice and will show blood products well. It is not well seen on a cerebral angiogram called "angiographically occult"
Type 1 hyperintense on T1- and T2-weighted imaging due to a hemosiderin core from subacute haemorrhage. Indication include after a bleed, intractable seizures or neurological dysfunction, Depends on location e.g. great care in highly eloquent areas such as brainstem where a conservative approach is taken. 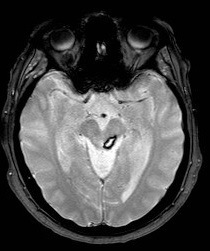 Surgical management of particular brainstem cavernomas is controversial.